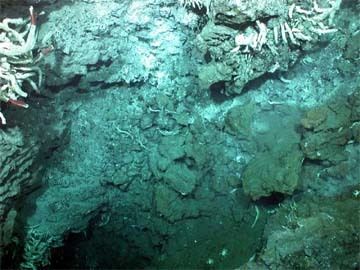 Base of hydrothermal vent structure at East Pacific Rise. Tube worms (Riftia pachyptila) are evident in the warm waters at the base of the structure. These organisms are specially adapted for the extreme conditions (pressure, temperature, chemical) found in the environment seen here.